Dance on the Lawn for the third time! Photo courtesy of Dance on the Lawn. 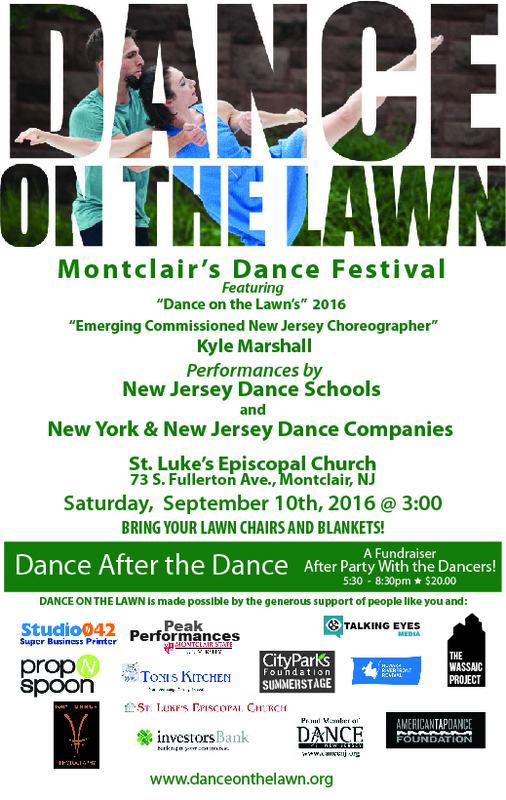 On Saturday, Sept. 10 at 3 p.m., please visit the St. Luke’s Episcopal Church as they host, Dance on the Lawn for the third time. It will feature Kyle Marshall as the “emerging commissioned New Jersey choreographer,” as well as a spectacular performance by the New Jersey Dance Schools and New York and New Jersey Dance Companies. The St. Luke’s Episcopal Church is located on 73 S. Fullerton Ave. in Montclair. For questions or more information, please email communications@slechurch.org. Get ready to pack your lawn chairs and blankets for this one of a kind event! There will be a fundraiser after party with the dancers from 5:30 p.m. – 8:30 p.m. at $20 per person. This community event is definitely another reason why Montclair is such a great place to live, work and play! Q: How did you decide to come up with Dance on the Lawn? What is the objective? A: I’ve wanted to share my love of dance with fellow Montclair residents so I began planning this event. There are other arts festivals in Montclair, so it just made sense to offer a dance festival too! Q: What do you believe makes Montclair so unique? A: Montclair embraces the arts and I knew that Dance on the Lawn: Montclair’s Dance Festival would get a big accepting hug. Q: Are you happy that you can conduct your event within the town of Montclair? A: I am a Montclair resident, so I simply asked some wonderful people I know in the community for assistance. They signed on and donated their services (St. Luke’s Episcopal Church, Toni’s Kitchen, Studio042, Tony Turner Photography, propNspoon, Talking Eyes and so many more). For sure, having good friends is a must! For a full list of of supporters, please click here.